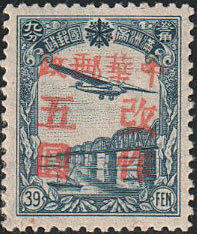 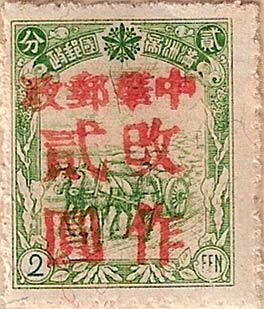 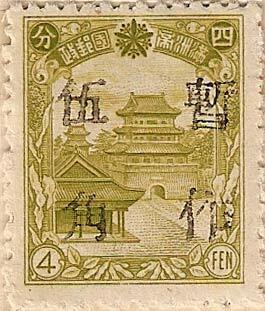 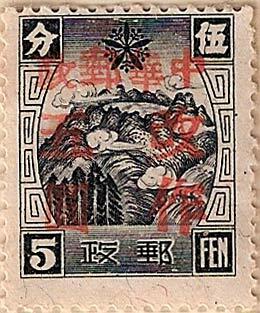 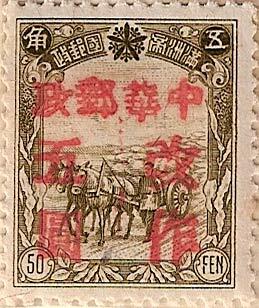 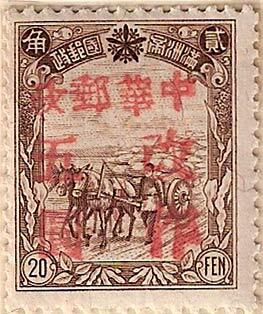 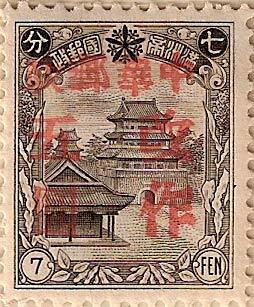 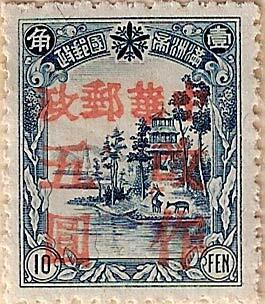 This is a single stamp set with a soft blue overprint reading 中國 China, 暫用 Temporary Use. 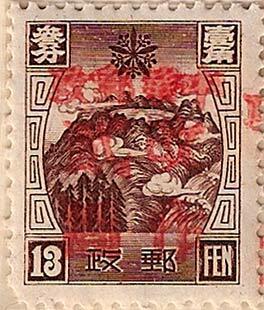 Always blurry as above. 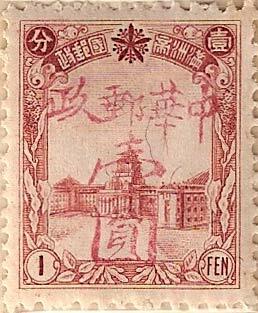 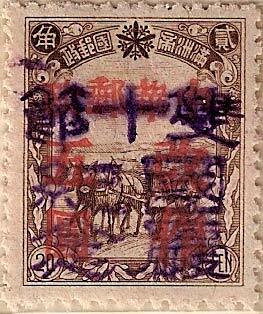 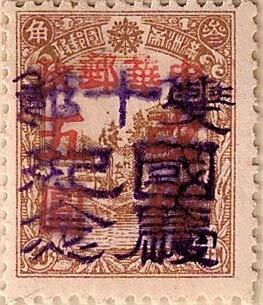 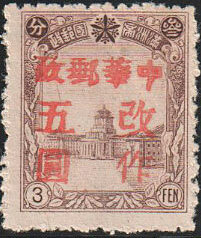 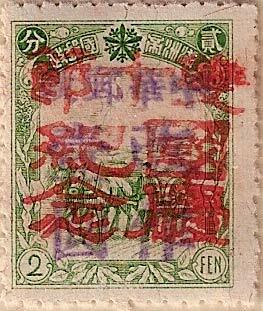 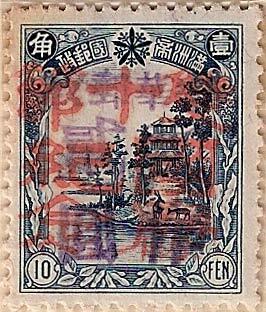 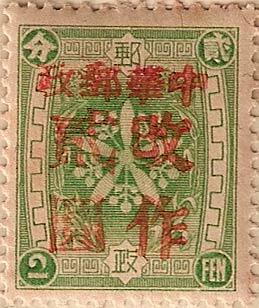 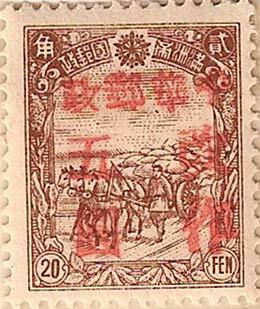 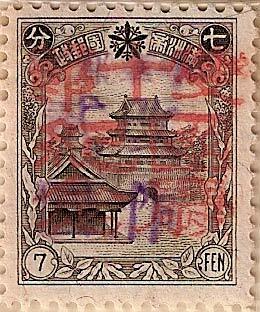 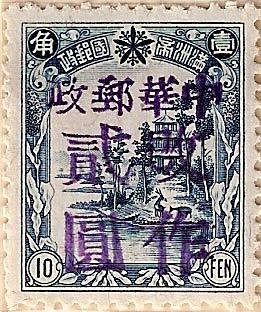 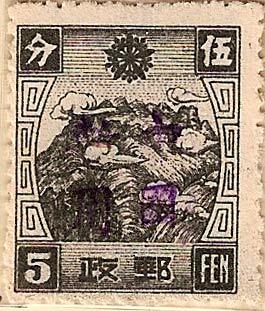 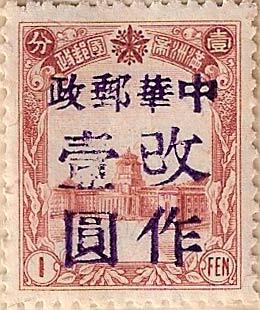 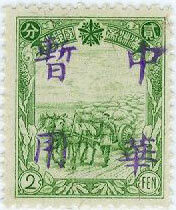 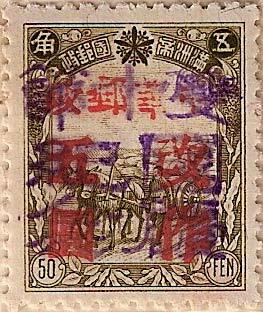 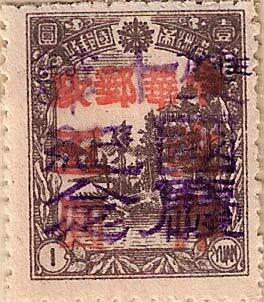 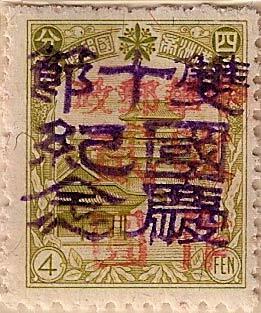 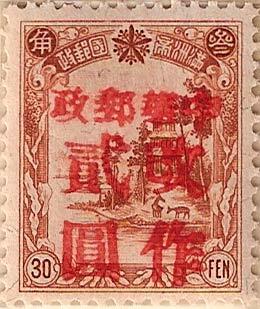 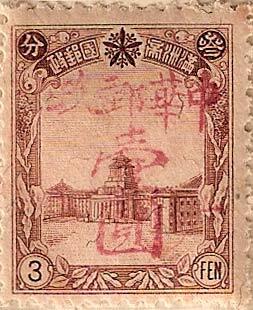 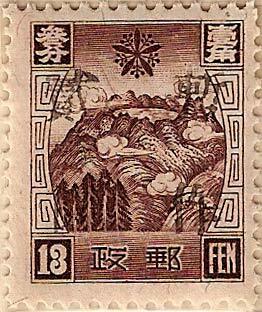 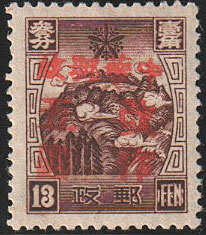 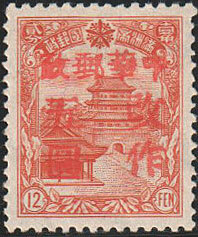 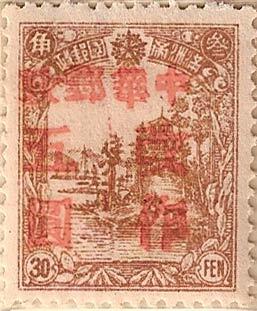 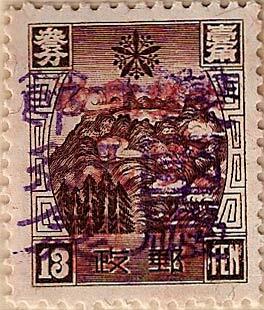 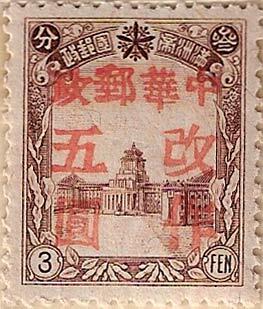 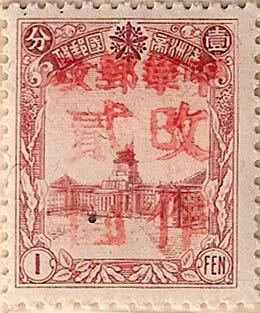 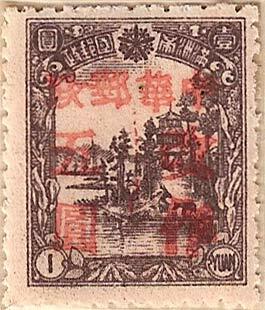 This is a single stamp set with a soft purple overprint reading 中國 China, 暫用 Temporary Use. 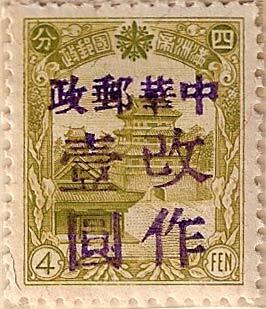 This is a complete set of three stamps with a hard purple four character chop reading 中華 China, 暫用 Temporary Use. 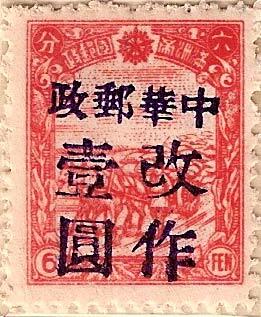 This is a very soft, pale red surcharge. 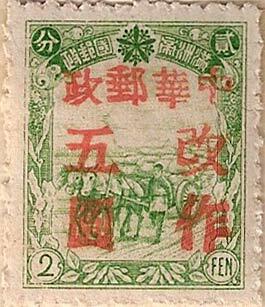 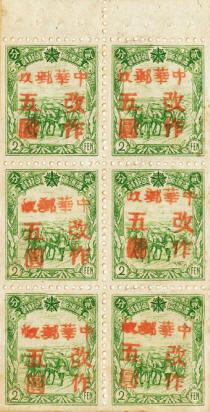 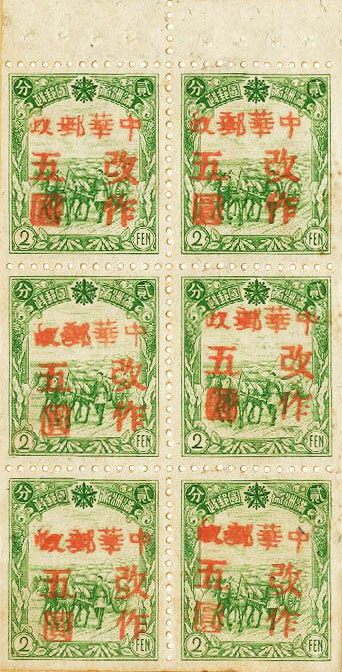 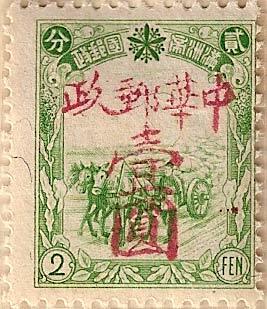 A set of four stamps all re-valued to 1Y. 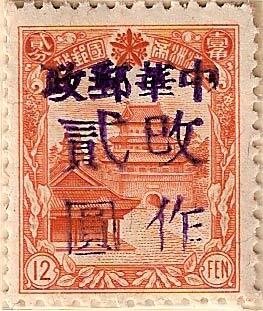 This is a full set of 11 values all with a hard purple chop. 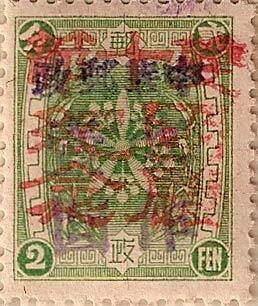 It also occurs overlaid with commemorative overprints - see below. 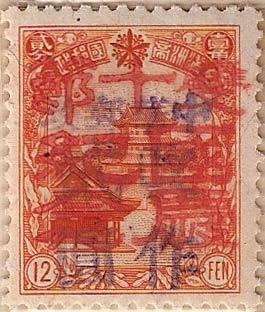 This is a full set of 19 values all with a hard vermillion chop. 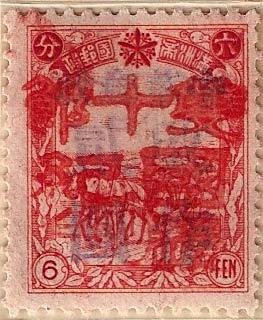 It also occurs with overlaid commemorative overprints - see below. 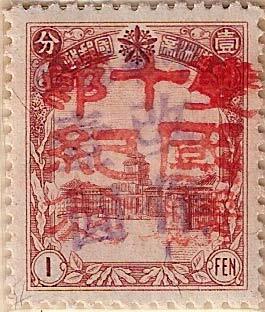 This hard vermillion set is similar to those above, but with four slightly smaller characters for the surcharge and the characters reading "temporary use". 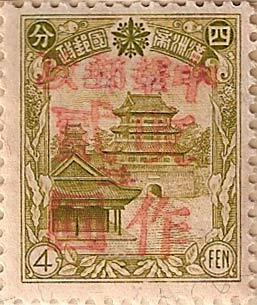 10 values plus the 2f and 4f booklet stamps in the set. 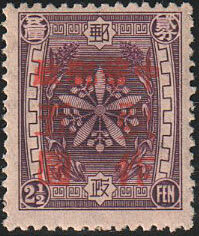 It is also seen in purple. 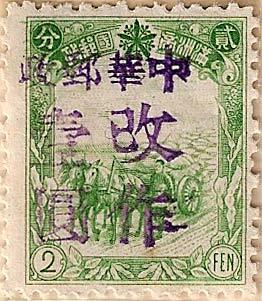 You need to look at these stamps carefully because they have two chops, the first in vermillion and the second in violet. 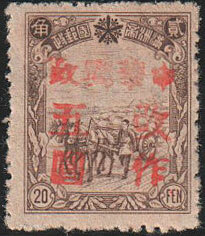 The vermillion chop is a Double 10 commemorative, this is overprinted with the violet chop which is a surcharge. 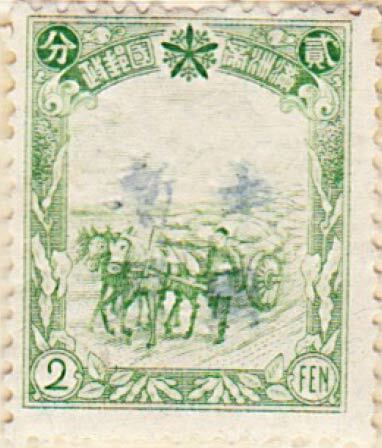 This is a full set of 7 stamps. 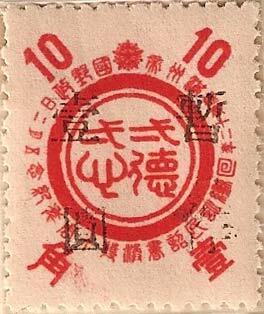 Unaddressed First Day Cover with the Double 10 postmark from Tungho. 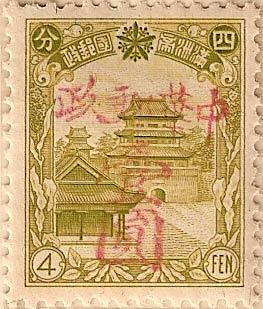 Stamp value $4. 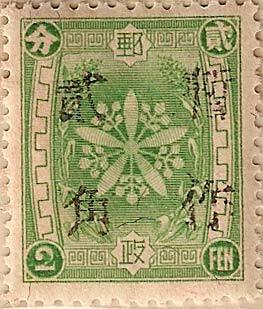 This set is the reverse of the above. 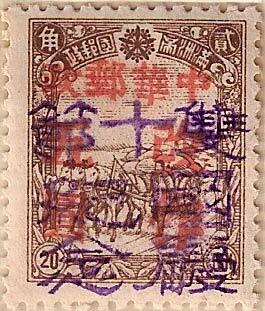 In this care the violet chop is a Double 10 commemorative, this is overprinted with a surcharge in violet. 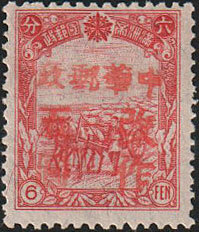 There are also seven stamps in this set. 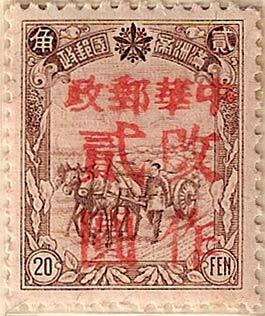 Double 10 (雙十節) Commemoratives celebrate the anniversary of the Wuchang Uprising of 10th October 1911. 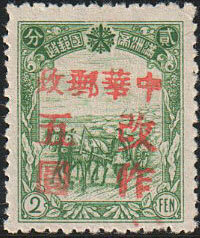 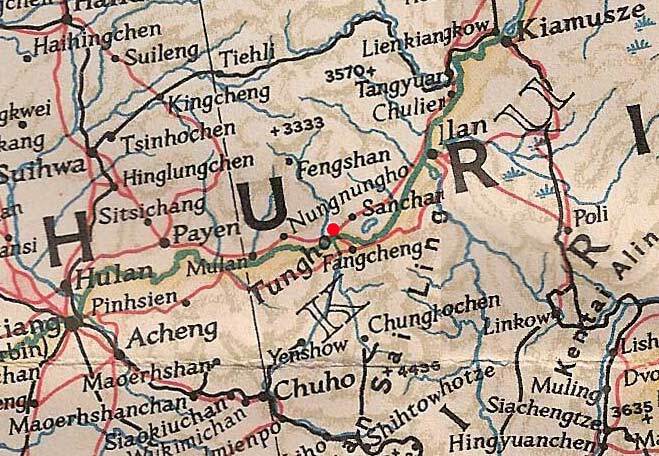 This uprising led to the overthrow of the Qing dynasty and the formation of the Republic of China. 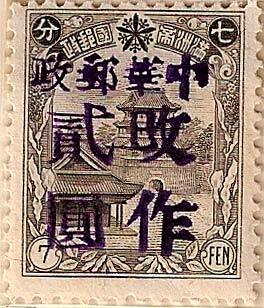 This is a simple soft black four character surcharge with the surcharge amount shown on the left and Temporary Use on the right. 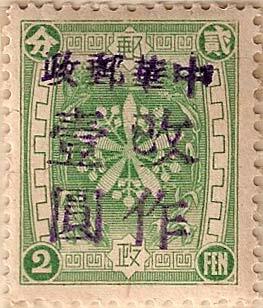 Kerr states that this set also appears with a purple chop.